Here are a couple of images of details as well. I will be finishing the edges on this painting in a few days and then it will be available for purchase with my other work at the online Gallery Artsy Home. I will update this post when the painting is posted. This is a sneak preview for those who follow and love my work. If you are interested in buying this painting and you do not want to wait that long, please feel free to contact me directly. Here is an image of the painting in context. The bouquets of flowers were purchased as the finishing touch for our participation in the local home and garden show. This seems on the surface to be fairly straight forward decision. They are beautiful so why not paint them? But this is not a reason for painting – as many things are beautiful and I have no interest in painting them. 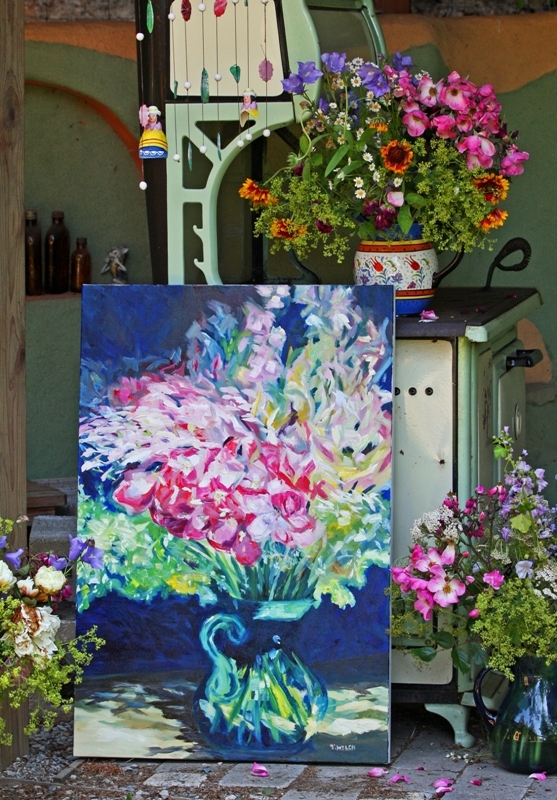 I now know that I wanted to paint them because these bouquets of flowers signify a transition point or milestone in my life as part of our Mayne Island community. For a bit of background, our home was built by a brilliant woman who accomplished the task by doing workshops. Many people in our community participated in the completion of our home. Though a newly completed home it was already well-loved before we ever entered the picture. So in many ways we have been hosted by our home in our community for the past five years. When I went to pick up these flowers the Farm Gate Store they were not yet ready. So I went with the owner, Shanti McDougall, to their farm with my box of vases. I then went along with her while she picked these flowers. She arranged them on her big kitchen table. We chatted the whole time and these flowers carry the warmth, passion and love of being on this planet together with such beauty and abundance of that moment. I left with these huge vases of flowers thinking about how much I have become part of the community where I have lived over the past few years. Then the next day more than 125 people came through our home and garden. The flowers were part of what anchored me in my inner sense of belonging as I open up our private space – our home – to the public. Our relationship to our home had shifted. We were now equal partners in hosting. We are now part of our community and no longer guests. 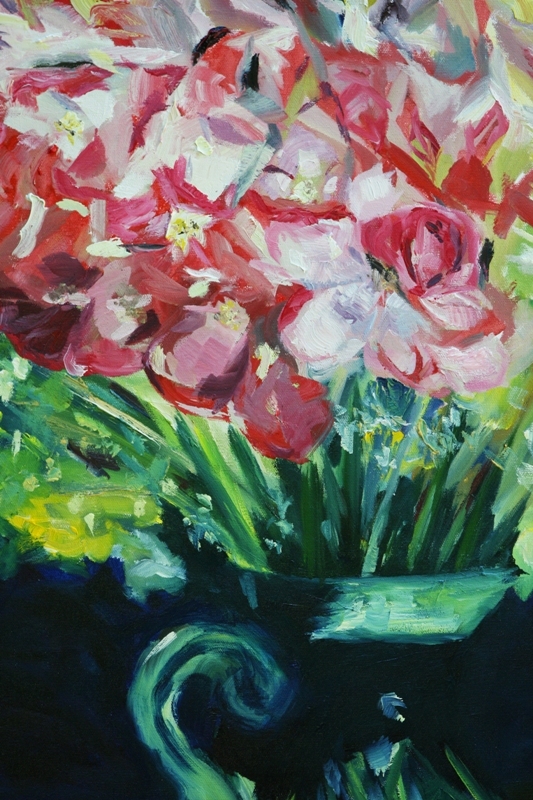 My painting of these flowers is a way of marking that transition. 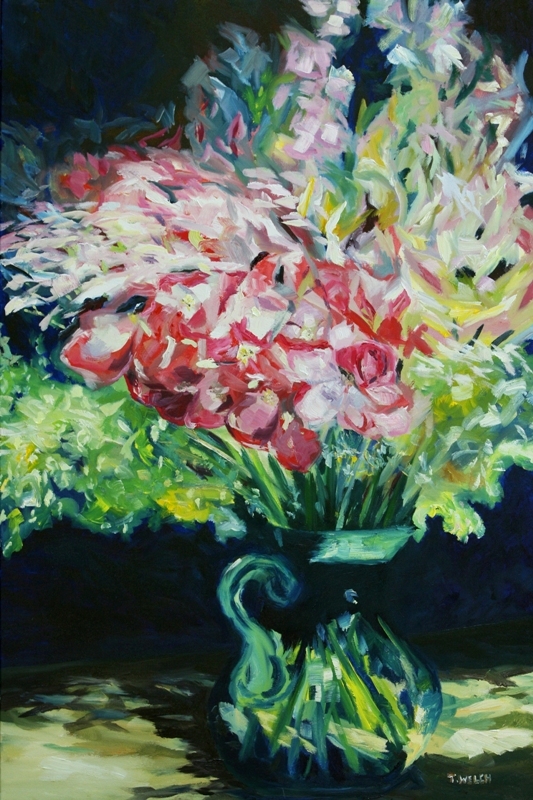 This is why the vase of flowers “must” be painted. Lovely painting and lovely story Terrill! Our art comes out of our life, so it doesn’t surprise me in the least to read, ” I paint whatever I am involved in during my daily living.” I’ve been thinking the same thing about my photography, and how my subjects and style has been influenced so dramatically by my transition back to small-town US from big-city Italy. I enjoyed visiting and seeing your work, as always! Man Alive! I only have a minute between clients, but I wanted to take the time to say wow, Wow, WOW! I especially love the image of the painting in context. Scrumptious! Thanks Laurie! 🙂 It will be here at the end of the day for a closer look and read if you choose. All the best to you and hope you have some fun things planned – maybe cycling? for the weekend. Beautiful! The “backstory” adds life and interest to the painting and your work! I am coming back for a more in-depth view and comment… I hope! Well it will be here when you are ready Jeff. This is one of the nice things about posting work on a blog – makes it easy to find when the time is right for the reader. Enjoy your day and wishing you some time in the early morning summer sun my friend. As promised, I have come back for another view! I love the finished painting on the ground/floor with the vases of flowers in represents all around it! It is such a documentary moment. Beautiful! As I wrote earlier the blog and purpose to paint this still life, offers such intensity to its being, to your honoring the community and the work that community has put into your house with your expression of art. 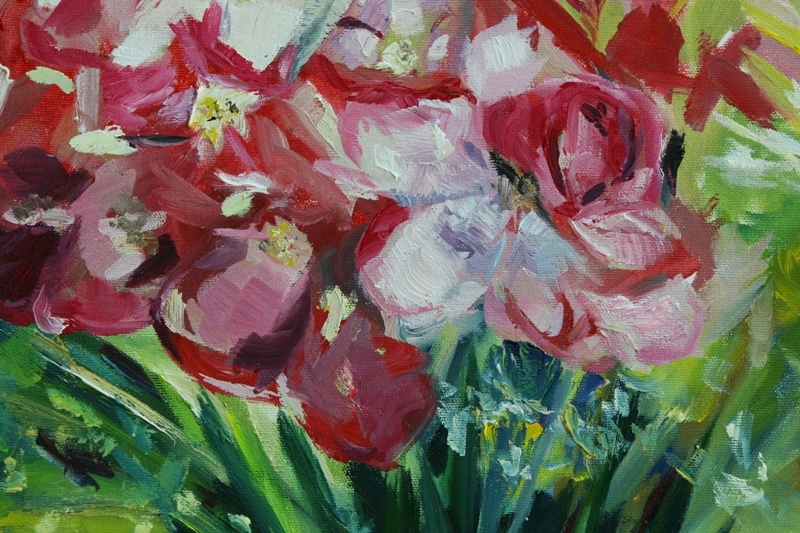 Ah yes Jeff, you are referring to the Creative Potager post “In the PINKS and other rose painting efforts” This wee 5 x 7 inch oil on canvas is a favourite of quite a few viewers. It has the loose nature while this larger one has much more form and structure to it. The paintings are so different it is no surprise to me that some like one more than the other. Thank you for stopping by with a full and thoughtful comment Jeff – most appreciated!